Google provide so many feature. Google is a huge company. Almost 90 % internet user use Google services. Google Search is main Google service provided by Google main site www.Google.com. Every body is well known about this service. Google Mail or Gmail is second most used service after Google search. This service allow user to compose, send, store and retrieve mails. With help of Google Maps you can find routes, Area and details of any place in this earth . Google Map provide the Maps for all countries in this world. Google Map also show routes from source to destination selecting the shortest and best paths. Google AdSense is Google publisher tool which allow publisher to post Ads in form of Text links, Image links, Video links etc. Many people are monetizing their contents and earning millions from this Google service. Google AdWords is Ad posting service for Advertisers. Advertisers who want to grow their business by advertising their business, than Google AdWords is best service for them. YouTube is best video sharing site in this world. You can watch and share your video's on YouTube. Even you can monetize you video and earn from it. Blogger is CMS for people who want to established his own free blog. Blogger provide free content hosting by Google itself. You can use custom domain with blogger. Google drive is online cloud platform, allow user to upload, download and edit files to and from cloud. Google code is online repository where coders can store their project and publish it online. Google code provide SVN repository to checkout codes. Anyone can create a free project on Google code and start collaborating with others. Google translate is tool which help to translate one language to other. Almost all language with grammar are supported by Google translate. You can translate speech, text or complete website with help of Google translate. 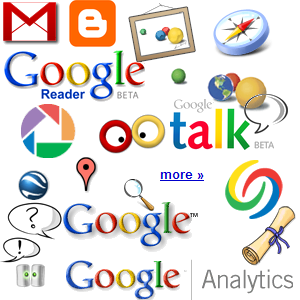 There are so many other services of Google.